Mmmm...this is some goooood morning food! Good Morning, Food! Meet my mouth! A while back, I posted a recipe for Petite Crustless Quiches, from French Revolution. Last weekend, I revisited that recipe, with a little twist. The twist being in the form of kale, and bacon. Yum. We always have "special" breakfasts on the weekend, so called by the Kiddos. Weekday breakfasts consist of either yogurt with frozen (and defrosted) berries, and homemade granola, or cereal. So, come the weekend, we all look forward to a more leisurely meal, generally involving eggs, waffles, or homemade bagels. And a good amount of coffee. Of course. The thing with preparing a special breakfast is, in my world, that while it appears to be time-consuming, it never really is. If the natives (ie, Kiddos) are growing restless, I appease their hunger with a bit of fruit, or a small bowl of cereal, until the real meal is ready. When guests stay over, there's nothing to it to whip up a batch of something that looks impressive, but is truly simple. Like these mini quiches. You could add absolutely anything to these wee bites: some steamed, chopped asparagus, any variety of herbs, cheeses, proscuitto, pancetta...you name it. Get creative. These are delicious served hot, or at room temperature, for breakfast, brunch, or any meal, really. First, cook your bacon. I prefer to cook mine on a baking sheet in the oven, 400 deg F. It takes around 15 minutes, turning once mid-way through. When crisp, drain on paper towels, then chop. While your bacon is cooking, prepare the rest of your ingredients, beginning with your kale. Bring a small saucepan of water to boil, and add your kale, with the ribs removed. Cook on a medium-high heat until tender, about 8 to 10 minutes. Drain in a colander, and once cool, squeeze out the excess water. You will have a small, handful-sized ball. Chop this up. Beat eggs, then stir in milk, salt and pepper to taste, herbs, and kale. Once your bacon is finished cooking, turn the oven down to 375 deg F. Grease a 12 cup muffin tin. Add equal amounts of chopped bacon to the bottom of each muffin cup, then pour over the egg mixture. Add the crumbled feta to the top of each mini quiche. Bake for 20 to 22 minutes, until the quiches just begin pulling away from the sides of the tin. Leave to cool in the muffin tin for about 5 minutes, then remove gently, using a knife to loosen the sides, if necessary. Easy peasy. And serious Good Morning Food. 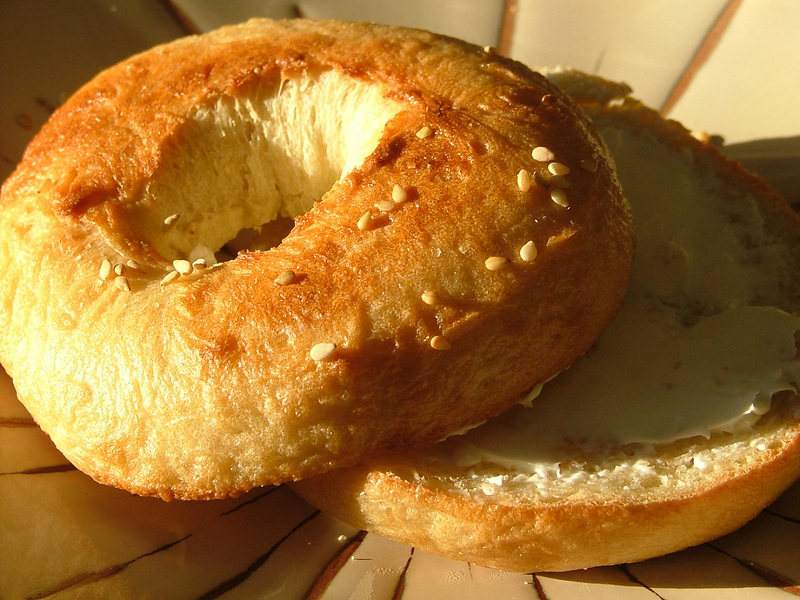 These bagels are another super simple, yet very impressive meal. If you have a bread machine, seriously, break it out, and get a batch rolling. It's a foolproof recipe, and who doesn't love fresh bagels and veggie cream cheese in the morning? I know I do. Happy Weekending, everyone!